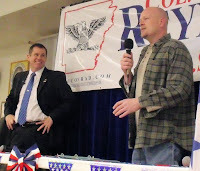 Back in 2009 Joe the Plumber, who didn’t go to Harvard, knew there was no way Obama could pay for all his schemes without raising everyone’s taxes. I am sure Obama knew that too. 2010 is going to be the year of the tax hike. Tags: economy, Gary Bauer, increase taxes, Joe the Plumber, Obamaspeak To share or post to your site, click on "Post Link". Please mention / link to the ARRA News Service. Thanks! By Howard Rich, Chairman, ALG: A year after it was passed, it has become painfully obvious to anyone with open eyes that the massive federal "stimulus" -- along with several other trillion-dollar government interventions in the free market -- has utterly failed to turn around America's economy. In fact, all this massive infusion of taxpayer cash has done is deprive our consumer-driven private sector of much-needed oxygen, while sending our annual deficits and national debt soaring to previously unthinkable heights. It's the classic Washington approach to the economy. When times are good, politicians in both parties spend excessively. When times are bad? They spend uncontrollably. As a result, at a time when families and small businesses were -- and are still -- forced to go without, government continues to grow by obscene levels, using every excuse in the book to justify its largesse. Among those excuses? “Green Jobs.” I wrote on this issue just last month, making the fundamental point that investing billions in “Green Jobs” had failed to stimulate the economy (or create jobs), and that Barack Obama’s pledge to invest billions more in “Green Jobs” was the wrong answer moving forward. This month, we’re discovering in detail why that is true. According to a series of new reports, billions of dollars in “stimulus” money that was supposed to go toward creating “Green Jobs” here in America instead went to foreign-owned companies – who “created or saved” the vast majority of their jobs overseas. Obviously there is nothing wrong with America investing in foreign businesses, as protectionism is a recipe for disaster. Eurus Energy America, a subsidiary of a Japanese-owned firm, received $91 million in “stimulus” funds and created only 300 to 400 temporary construction jobs. Permanent jobs created? Less than a dozen. EnXco, a French-owned firm, received $69.5 million in “stimulus” funds and yet produced only 200 construction jobs and “about a dozen” permanent positions. A-Power, a Chinese-owned firm, is in line to receive nearly $450 million in “stimulus” funds – for a project that will create thousands of Chinese jobs but only a few dozen American positions. Cannon Power Group, an American-owned firm, received $19 million in “stimulus” funds but spend most of that on German-made turbines. So far they have created fewer than 300 construction jobs and “20 to 30” permanent positions. Cannon is in line to receive another $150 million in “stimulus” funds, by the way. In case the trend isn’t clear, America’s massive investment in “Green Jobs” has been a colossal, costly failure – unless you’re looking for work overseas. For all the promises of the Obama administration, here at home these taxpayers billions have amounted to little more than a few thousand temporary construction positions and a few hundred management jobs. In fact, there’s a good chance that the government employees hired to promote “Green Jobs” outnumber the actual permanent “Green Jobs” created. However you do the math, these positions are obviously a mere drop in the bucket compared to U.S. job losses in the wind manufacturing segment of the energy economy alone, to say nothing of the millions of lost jobs nationwide. Worse still, the lunacy isn’t stopping. We are continuing to pour hundreds of millions of dollars into this failed framework, which uses American sweat to create permanent positions (and profit) for foreign companies. Frankly, it’s time for Obama to come clean on the “Green Jobs” scam – and to explain why his so-called “transparent and accountable” administration didn’t catch it sooner. Tags: American jobs, green jobs, jobs To share or post to your site, click on "Post Link". Please mention / link to the ARRA News Service. Thanks! House Republican Leader John Boehner (R-OH): By scheming to pass the massive government takeover of health care the American people have already rejected, are Senate Majority Leader Harry Reid and Speaker Nancy Pelosi undermining President Obama’s stated desire to have a “bipartisan” and “transparent” dialogue on this issue? House GOP leaders have challenged Leader Reid and Speaker Pelosi to respond to news reports that they are rushing to finalize a backroom deal amid increasing questions about the credibility of the proposed White House health care summit. It has previously been reported that President Obama hopes to walk into the summit with a backroom “agreement in hand. ”’…[T]he plan is to have President Obama sign the Senate bill before signing the legislation making the changes, even though Congress will approve them in reverse to satisfy skeptical House members who refuse to pass the Senate bill before changes are made. The Speaker’s top health care aide also confirmed that this “pre-negotiated package” would include the sweetheart deals Democrats made with their liberal special interest allies before the Massachusetts special election. Sure enough, The Christian Science Monitor reported today that special interest groups are calling on Democrats to finalize a health care bill in advance of the proposed health care summit. Tags: conservative democrats, government healthcare, Harry Reid, John Boehner, Nancy Pelosi, transparency, US House To share or post to your site, click on "Post Link". Please mention / link to the ARRA News Service. Thanks! · DENNIS BLAIR, Director Of National Intelligence: “I -- I Was Not Consulted. The Decision Was Made On The Scene.” . . . Tags: bomber, CIA, DHS, DNI, FBI, Islamic terrorist, Miranda rights, Robert Gibbs, The White House To share or post to your site, click on "Post Link". Please mention / link to the ARRA News Service. Thanks! Today in Washington, D.C. - Feb 12, 2010 - Will Obama Change The Policy on Mishandled Terrorist Trials? Senate and House Were not in session today. The Senate returns on February 22nd, when it will take up a jobs bill (H.R. 2847) with an amendment from Majority Leader Harry Reid likely serving as the basis for debate. A cloture vote on the bill is scheduled for that evening. Yesterday, the Senate confirmed 27 relatively uncontroversial nominees. It’s troubling that the Obama administration apparently did not anticipate the very reasonable objections from local officials and many other across the political spectrum to trying terrorists in civilian courts. The problems with this approach would seem to be readily apparent: beyond the security expense, the heightened risk of terror attacks, and the fact that terrorists will have a platform to propagandize and grandstand, there are the myriad risks to intelligence and national security presented by civilian trials. And that doesn’t even get into the consequences of extending constitutional protections to foreign enemy combatants. Yet The Washington Post story seems to indicate that much of the opposition to civilian trials for terrorists was not anticipated by the White House when it made the decision. In the Quinnipiac poll respondents overwhelmingly (76%) believe the Christmas Day bomber should be treated as an “enemy combatant” rather than “an ordinary criminal” (19%), but the administration has continued to attempt to justify processing him through the criminal justice system. The Obama administration needs to seriously reevaluate its approach to the War on Terror. Simply having the president jump in to decide where the 9/11 plotters should be tried is to miss the point entirely. Tags: Barack Obama, domestic terrorists, Gitmo, jobs bill, terrorist trials, US Congress, US House, US Senate, Washington, D.C. To share or post to your site, click on "Post Link". Please mention / link to the ARRA News Service. Thanks! Members of the Senate Finance Committee unveiled a long-awaited bipartisan jobs bill Thursday morning — only to have it scrapped within hours by Senate Majority Leader Harry Reid. [Reid] killed the bill after hearing complaints from members of his own caucus, who argued that Finance Committee Chairman Max Baucus (D-Mont.) had gone too far beyond the core goal of job creation in order to win over Republican support. [H]is bill "would include four basic provisions: Build America bonds, a small-business tax program that allows quick expense write-offs, a one-year extension of the highway act and a bipartisan tax-credit deal struck by Sens. Orrin Hatch (R-Utah) and Chuck Schumer (D-N.Y.). And then when we finish that, we’ll move onto the tax extenders and all the other stuff . . . The message that they need is that we’re doing something about jobs." Harry, forget the make-over, it is to late! Compared to Barack Obama's slinging the bull, Senior Senator Harry Reid has proved to be what we know him to be -- a loser. 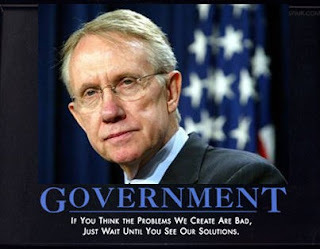 Tags: American jobs, jobs, dictator, Harry Reid, jobs bill, Washington D.C. To share or post to your site, click on "Post Link". Please mention / link to the ARRA News Service. Thanks! Tags: palm pilot, palm reading, political cartoon, Robert Gibbs, White House, William Warren To share or post to your site, click on "Post Link". Please mention / link to the ARRA News Service. Thanks! 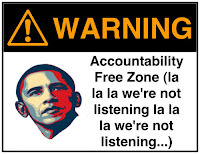 Does Obama Listen To Himself? by Gary Bauer, Contributing Author: Okay, folks, you have to sit down for this one. President Obama just did an interview with Bloomberg BusinessWeek that was astonishing for its sheer audacity. He actually claimed that his administration has promoted a “fundamentally business-friendly agenda” and he said that he and his top officials are “fierce advocates” of free enterprise. No, this isn’t an early April Fool’s joke. The president went on to say, “You would be hard pressed to identify a piece of legislation that we have proposed out there that, net, is not good for businesses.” Really? Not even one? I’ll take that challenge. How about the government takeover of healthcare? House Democrats passed a socialized medicine bill that costs more than $1 trillion. It was paid for with a big tax hike that would negatively affect 60% of small businesses. How about cap and trade? The Obama Administration admits that this is a huge tax increase on families that would kill jobs because businesses would also face much higher electricity and transportation costs. How about his constant bashing of businesses? The CEO of Loews Corporation, which owns hotels, said Obama’s anti-business rhetoric did “a good job of killing” the travel industry. He added, “The criticism that took place of group travel was really a death knell for the industry. It’s easy for the politician to get the sound bite. What they are doing with those sound bites is putting maids and bellmen out of work.” Not to mention workers in related industries like restaurants and airlines. I could go on, but that wouldn’t be fair. It’s like shooting fish in a barrel. Tags: Barack Obama, business, Campaign for Working Families, Gary Bauer, not listening, the economy To share or post to your site, click on "Post Link". Please mention / link to the ARRA News Service. Thanks! Senate will reconvene at 2:30 PM today. House is Out! On Tuesday, Democrats failed to get the 60 votes needed to invoke cloture on the nomination of former SEIU lawyer Craig Becker to the National Labor Relations Board by a vote of 5-33 with two democrats joining the Republican opposing the nomination. Note: once it was clear the nomination was defeated; 15 Senators did not even vote. Maybe five other Democrats wanted to hide their voting against the president nomination. Becker’s nomination is controversial because of concerns that Democrats want to enact parts of their stalled card check bill through the regulatory process on the NLRB. Also on Tuesday, the Senate confirmed Joseph Greenaway as a judge on the 3rd Circuit Court of Appeals by a vote of 84-0. One of many confirmed; one rejection. Now President Obama threatens recess appointments including appointing Craig Becker. I guess the SEI Union pockets do run deep and maybe they they even have more than the ear of President Obama. And this isn’t the first time the Obama has signaled he could support tax increases that violate his pledge. In December, the health care reform bill passed by Senate Democrats and supported by Obama included provisions that were likely to increase taxes on Americans making less than $200,000. A number of Democrats even acknowledged this by voting for a Republican amendment that would have prevented such tax increases in the bill (54 Democrats ultimately voted to kill the amendment). Not to mention the over $500 billion overall in tax hikes included in the bill. Tags: Barack Obama, Craig Becker, nominations, SEIU, summit, tax increases, US Congress, US House, US Senate, Washington D.C. To share or post to your site, click on "Post Link". Please mention / link to the ARRA News Service. Thanks! Boehner: Why discuss health bill that can't pass? Tags: Barack Obama, government healthcare, John Boehner, US House To share or post to your site, click on "Post Link". Please mention / link to the ARRA News Service. Thanks! Jim DeMint Twitters: It's going to keep snowing in DC until Al Gore cries "uncle"
Snowmageddon in Washington, D.C. "
Inhofe family builds igloo "Gore's new home"
Tags: Al Gore, Jim DeMint, snowballs, twitter, Washington D.C. To share or post to your site, click on "Post Link". Please mention / link to the ARRA News Service. Thanks! Tags: climate change, snow, irony, Political Cartoons, Washington D.C., William Warren To share or post to your site, click on "Post Link". Please mention / link to the ARRA News Service. Thanks! RNC, Senate and House GOP Leadership Getting the Message! Bill Smith, Editor: There is evidence expressed by conservative GOP Senate and House members in recent months that they have heard the American public. Now, we note the effect on the national GOP campaign support committees. As an example: Rob Jesmer, Executive Director, National Republican Senatorial Committee (NRSC) advised today that over the last few months the NRSC has been been asking grassroots supporters for feedback on the political landscape and the NRSC efforts to elect more Republicans to the Senate in 2010. He said that the NRSC plans to use this information to improve our strategy as we work toward victory in November. - 89% believe the state of our union is weaker now than when Democrats took control of Washington. As previously reported, the National GOP Committee had adopted guidelines in supporting candidates and unanimously called on RNC chairman, Michael S. Steele, to "carefully screen" candidates for their adherence to conservative values before granting them RNC financial help. The resolution specifically calls on the national chairman to take into account the voting records and statements of all GOP candidates for evidence that they support the "core principles and positions" of the party's national platform. They also stipulated that candidates who fail the screening should not receive money and other campaign support from the RNC or its sister committees. The resolution also calls on Mr. Steele and leaders of the House and Senate GOP campaign committees to deny financial and other support support to "candidates who clearly do not support the core principles and positions" of the national platform as adopted at the 2008 Republican National Convention. For many months, the NRCC and Senate Republican Minority Leaders offices hve opened communication with conservative bloggers nationwide and have arranged numerous interviews and conference calls with Republican Senators and Representatives. This dialog has allowed members of Congress to share about issues and situations they face in Congress and has allowed "main street" bloggers to ask grassroots questions and to provide feedback from their area of the country. It appears that a significant majority of incumbent Congressional Republicans have awakened to the conservative cry of America. There may be real Hope and Change in 2010 as the GOP is focused back on its conservative roots, platform and principles. I hope that the RNC, NRSC and NRCC will NOT interfere in primaries by providing financial support to its present members or to other GOP candidates before the State primaries are concluded. When the primaries are over, we expect these groups to help candidates and the grassroots take back Congress in 2010. Tags: 2010 Elections, conservatives, NRCC, NRSC, RNC, US Congress, US House, US Senate To share or post to your site, click on "Post Link". Please mention / link to the ARRA News Service. Thanks! 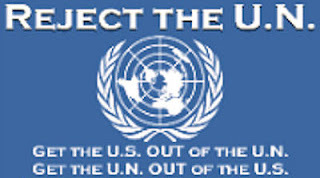 by Gary Bauer, Contributing Author: America is regrettably reaping the bitter fruit from the seeds of appeasement Obama has sown over the past year. Since taking office, Obama has made it his mission to apologize to our enemies and ignore our allies. He is the anti-Reagan, rejecting the notion of peace through strength. Rather than projecting confidence, he’s signaled weakness and put us in danger. Thugs and tyrants the world over sense that Obama is soft. For example, Iran has executed several leaders of the pro-democracy movement and sentenced more to death in recent days with barely a peep of protest from the administration. In response to Obama’s conciliatory efforts to contain Iran’s nuclear program, Ayatollah Khamenei, Iran’s supreme leader, promised a “punch” that would leave Western nations “stunned.” And Iranian “president” Mahmoud Ahmadinejad announced that the Islamic regime is enriching more uranium and expanding its military facilities. China currently holds nearly $800 billion in U.S. bonds, and it is financing Obama’s astonishing spending spree. Now China is threatening an economic Pearl Harbor. Whether it’s Arab oil or Chinese credit, under Barack Obama America is becoming more dependent on our enemies, and no superpower will long survive in such a weak position. “My advice to the president is, with a great deal of respect, take New York Off your radar screen. Find another location. The most logical place is in some isolated military base that is completely far away from population centers and is self-contained.” That sounds like GITMO to me, and the senator was none other than New York liberal Chuck Schumer. When a liberal like Schumer sees the light, conservatives are clearly winning the debate. But here’s more evidence of the Left’s misplaced priorities. Remember the Department of Homeland Security report last year that suggested that conservatives, soldiers and pro-life activists were potential “domestic terrorists”? The administration took a lot of heat for that report and eventually retracted it. But we’ve learned in recent days that it also acted on the report. The Associated Press broke a shocking story this week that the Obama Administration did in fact track pro-life activists in Wisconsin last year, conducting a threat assessment on several groups even though they clearly posed no threat to national security. Unfortunately, this Administration is incredibly sensitive about making sure that admitted terrorists get their constitutional rights. But when it comes to American citizens, the administration tramples on the Constitution because its ideology tells it that the war against Islamic terrorism is just a misunderstanding and that conservatives pose the real threat. Tags: China, Gary Bauer, Gitmo, Homeland Security, Iran, Islamic terrorism, national security To share or post to your site, click on "Post Link". Please mention / link to the ARRA News Service. Thanks! 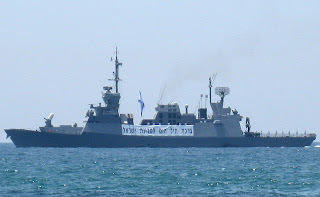 Israeli Warships en Route to The Persian Gulf? Will Nuclear Weapons Be Used Against Iran? A Commentary by J. D. Longstreet: Reports are coming out of the Arab Media that two Israeli “Missile Boats” passed through the Suez Canal, on February 6th, enroute to the Red Sea. Speculation is that the ultimate destination is, in fact, the Persian Gulf. Last summer, another Israeli warship passed through the Suez Canal accompanied, reports say, by an Israeli submarine. You may read the article HERE. These reports combined with Iran’s recent promise to strike the west with a “stunning blow” on February 11th, would lead one to conclude the stage is being set for a “counter strike” should Iran go through with it’s threat. There is another line of thought, which says the stage is being set for the attack by Israel on Iran’s nuclear facilities. The Egyptians are reporting that the Israeli Navy, in cooperation with the US Fifth Fleet, have been charting Persian Gulf waters and Iranian shorelines in preparation for attacks by the Israeli naval and special operations forces. These reports, for what they are worth, and frankly, we don’t know yet, are saying the Israelis and Americans are locating and defining routes to be used by their forces to drive into Iran, by air and by ground, to destroy Iran’s nuclear facilities. According to Debka Files the Egyptians are reporting that Saudi officials are pressing the US to explain why they were not told of US assistance to Israel in planning the attack on Iran. These same reports say that some Gulf intelligence services and navel units have actually tracked some of the Israeli/American movements and are able to document them. You may read this report, in its entirety, at DEBKA FILES HERE. Why do we give this report and others concerning these Israeli naval movements credence? Because Iran has been making aggressive noises lately. As others have noted and reported, Iran tends to do this when they feel nervous and threatened. This would explain their most recent threats to strike the west “a stunning blow” on February 11th. A couple of things: The American President, Obama, is NOT, I repeat, is NOT, a supporter of Israel. Number two: Bebe Netanyahu doesn’t give a d**n what Obama does or does not support! Netanyahu will do whatever is necessary to preserve the lives of Israelis and the nation of Israel – and -- in our opinion, he should. Obama’s lack of support for Israel is another mistake, a HUGE mistake on his part. The American people, generally speaking, support Israel. We tend to always pull for the underdog, especially if that underdog is a democracy. Remember, the US was the first nation to recognize the State of Israel as a new state. We have supported Israel, to one degree or another, ever since -- right up until Obama. We would suggest the Obama Regime get real -- and get real fast -- because there is another player in all this – Russia. Russia will almost certainly be involved in any fight between Israel and Iran. They will be in the fray on the side of Iran. Russia has a very real interest in Iran as a countermeasure to what they see as U.S. Mideast dominance. No matter how one interprets the latest news about the Israeli Missile Boat maneuvers, one thing is certain: Israel is preparing to strike Iran and destroy Iran’s nuclear facilities. That is a given. It is also a given that no matter what Obama thinks about Israel, the US WILL be involved in the fight against Iran and Russia. In all likelihood Iran’s surrogate Syria will attack Israel from the north to force Israel to commit a large portion of its military resources to a fight on its own ground. Anything thrown at Syria will not be thrown at Iran. Obama, and other national leaders with weak knees, should not be surprised if Israel uses nukes against Iran to ensure Iran’s nuclear facilities are completely destroyed. Netanyahu knows he will be condemned by most European nations if he facilitates his nuclear arsenal. That is NOT, however his concern. Netanyahu’s only concern is the preservation of Israel. Iran has repeatedly declared that it will "wipe Israel off the map" and the IDF is taking this threat seriously -- as it should. Whatever happens, Israel has been preparing for war with Iran for many months. The Israel Defense Forces, some months ago, purchased three new Airborne Warning and Control Systems (AWACS) and have several submarines on alert in the region. All of this comes at a time when President Obama is asking for a 25% cut in the US Military. Even without a third front, a third war in the Middle East in which the US military is involved up to it’s waist, it makes absolutely NO SENSE to reduce the size of the US Military by one soldier, let alone by one-quarter of its force. With the current developments in the Gulf, America may find that it must re-establish the draft to ENLARGE its standing military force. In fact, the Progressives are so enamored of the draft that may be exactly what they are attempting to do. My crystal ball remains dark. I cannot predict what will happen in the short run between Israel and Iran. In the long run, however, a crystal ball is not needed. At some point in the future, Israel and Iran WILL collide in war. Alongside Israel will be the US. Alongside Iran will be Russia. With US forces stretched to the limit, the use of nuclear weapons by the US will certainly be on the table. The only question is – will Obama have the intestinal fortitude to use them. Or -- will he allow US forces to be annihilated? Tags: American-Iranian Council, draft, Israel, JD Longstreet, national security, nuclear attack, nuclear weapon, Persain Gulf, Russia, United States, war To share or post to your site, click on "Post Link". Please mention / link to the ARRA News Service. Thanks! 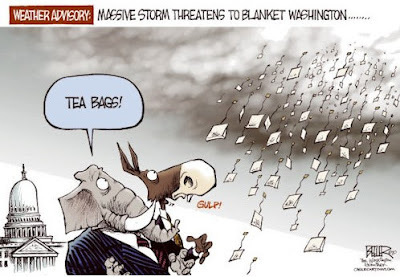 Massive Storm Threatens Washington, D.C. 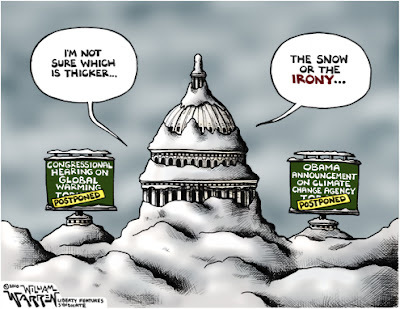 Tags: Nate Beeler, political cartoon, TEA Parties, Washington D.C., Weather To share or post to your site, click on "Post Link". Please mention / link to the ARRA News Service. Thanks! Update: Senate rejected Craig Becker to National Labor Relations Board on a cloture vote by 52-33. Two Democrats, Sens. Blanche Lincoln (Arkansas) and Ben Nelson (Nebraska) voted against Craig Becker with 15 Senators not voting when they knew Becker's nomination was defeated. The failure to get 60 votes on a procedural motion leaves the nomination stalled, and as detailed below President Obama has threatened to bypass the Senate and make a recess appointment if certain nominees are not confirmed. The House remained out of session because of too many absences created by bad weather. The Senate met this afternoon and begin debate on the nominations of Joseph Greenaway to the 3rd Circuit Court of Appeals and former SEIU lawyer Craig Becker to the National Labor Relations Board. Becker’s nomination is controversial due to concerns Democrats want to enact parts of their stalled card check bill through the regulatory process on the NLRB. At 5 PM, the Senate will vote on confirming of Greenaway and if the Democrats secure cloture the Senate will vote on cloture on the Becker nomination. As Washington, DC braces for another major snowstorm, political attention has focused on a new bipartisan health care summit at the White House proposed by President Obama over the weekend. However, Obama was not willing to be bipartisan this morning as he threatened his way or else. He then stated if the Senate did not cooperate on all his nominations that he would make recess appointments. As some may recall the Dems (including Sen. Barack Obama) blocked President George W. Bush's appointments including judicial appointments to the Federal court which left the court without the manpower to bring to trail cases. The Dems then used a "trick" of never officially being in recess and leaving behind a fewDemocrats to bring the Senate into session ever few days so that President Bush could not make any recess appointment. Tags: Barack Obama, Craig Becker, nominations, summit, US Congress, US House, US Senate, Washington D.C. To share or post to your site, click on "Post Link". Please mention / link to the ARRA News Service. Thanks! Tags: Freedom, military, music, support troops To share or post to your site, click on "Post Link". Please mention / link to the ARRA News Service. Thanks! Scary Reality! What if George Bush . . .
Phil Smith, Florida Reader / Guest Article: More Scary Reality! If George W. Bush had bowed to the King of Saudi Arabia, the Emperor of Japan and the Mayor of Tampa would you have approved? If George W. Bush had filled his cabinet and circle of advisers with people who cannot seem to keep current in paying their income taxes, would you have approved? If George W. Bush had stated that there were 57 states in the United States, would you have said that he is clueless. If George W. Bush's administration had given the okay for Air Force One flying low over millions of people followed by a jet fighter in downtown Manhattan causing widespread panic, would you have wondered whether they actually get what happened on 9-11? If George W. Bush had created the position of 32 Czars who report directly to him, bypassing the House and Senate on much of what is happening in America, would you have approved. If George W. Bush had ordered the firing of the CEO of any major corporation, even though he had no constitutional authority to do so, would you have approved? If George W. Bush had then taken actions or failed to take action on the national debt which is projected to be $20 Trillion in five more years (2015), would you have approved? If George W. Bush had mis-spoken the military word "corps" as "corpse" instead of as "core": Military Corpse, Navy Medial Corpse, etc., would you have approved? If George W. Bush had taken actions and prevented corrections that resulted in over 10% of Americans being unemployed in January 2010, would you have approved? So, tell me again, what is it about Barack H. Obama that makes him so brilliant and impressive? Can't think of anything? Don't worry. Obama has done all the above items in 14 months. -- Just imagine, he has 2 years 9 months before the 2012 elections. Maybe you can reflect by then on his "not so impressive" accomplishments. Tags: 2010, 2012 elections, Barack Obama, economy, George Bush, unemployment To share or post to your site, click on "Post Link". Please mention / link to the ARRA News Service. Thanks! 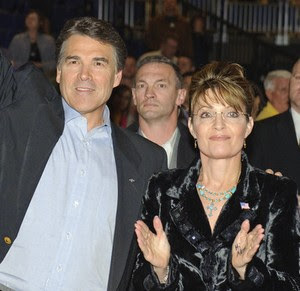 Update on prior story: Sarah Palin campaigned for Texas Governor Rick Perry and revealed her latest Palm Pilot. Her latest note on her hand: "Hi Mom." Tags: palm pilot, Rick Perry, Sarah Palin, Texas To share or post to your site, click on "Post Link". Please mention / link to the ARRA News Service. Thanks! 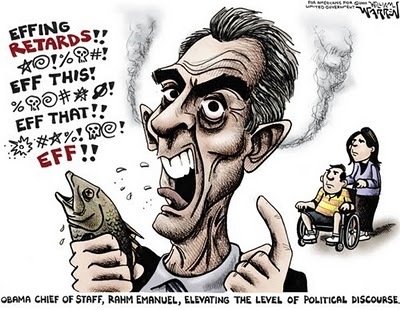 Tags: political cartoon, Rahm Emanuel, Obama admin, Chief of Staff, fowl language, William Warren To share or post to your site, click on "Post Link". Please mention / link to the ARRA News Service. Thanks! Please consider the following comments by Megan McCain on "The View." This arrogant know-it-all young "lady" has been attempting to build a reputation with her sassy comments. On "The View" she trashes Tea Party people and demeans people over 65 - move over Daddy McCain. However, I would agree that Tom Tancredo does not represent the Tea Party movement. An unknown before Daddy McCain brought her to the forefront as in his presidential campaign, Megan's comments since the 2008 elections have continued to depict her to moving farther to the left and she appears very uncomfortable with Republican ideals or the platform. She admitted on "The View" that she has not attended a Tea Party event because she has "ideological differences." With what aspects of love of country, stopping the overspending, staying out of our health care, stopping taking over banks, the auto industry and health care industry, opposing the expansion of the federal deficit and supporting the Constitution does Megan have ideological differences? Oh, yes she did mention she does not like people over 65, they do not start revolutions. And remember, Uncle Harry says they 'stink." Not sure yet if Megan is a RINO or liberal-lite. But as she continues to speak, obviously, she will tell us in her own opinionated words. Megan also promised to tell her opinion of Sarah Palin in her soon to be released book. If there is war in in the GOP, it will be be because of neo-Republican like Megan. But just maybe she will pull a Hillary and be a Democrat. Hint: liberals love her or at least her liberal leaning comments coming from the McCain family! Warning "The View" panel who loves Obama trashes Palin in the video. Tags: Megan McCain, Sarah Palin, seniors, tea party, the view, Tom Tancredo, video To share or post to your site, click on "Post Link". Please mention / link to the ARRA News Service. Thanks! Huge Scandal – Palin Puts Some Speech Notes On Her Hand - Teleprompter Jealous! by Gary Bauer, Contributing Author: Media elites and pointy-headed leftwing intellectuals are having spasms this morning over Sarah Palin. What set them off this time? A liberal blogger discovered that Gov. Palin had written some “cheat” notes on her hand to use during her speech at the Tea Party convention this weekend. Every commentator in the country is using the incident to denounce her as stupid, non-intellectual, un-presidential and unserious. By the way, the “reminders” on her palm were “Energy,” “Cut taxes” and “Lift America’s spirits.” Oh the horror! Of course most of the media talking heads continue to think that Obama is just the smartest, coolest guy that has ever occupied the Oval Office. Most of them thought it was silly when we raised questions about why our Harvard-educated president couldn’t say “Good morning” without his co-president – the Teleprompter. And even with the teleprompter, Obama manages to display serious ignorance. In a speech last week, he told a story about a Navy corpsman apparently not realizing that the “p” and the “s” in “corpsman” are silent. Twice, with the teleprompter, Obama pronounced the word as “corpse man.” Now there’s a job I wouldn’t want. The media and the Left desperately want America to think that only liberals are smart. I remember how Reagan was mocked unmercifully because he used note cards during his speeches. The media had nothing but contempt for Dan Quayle. 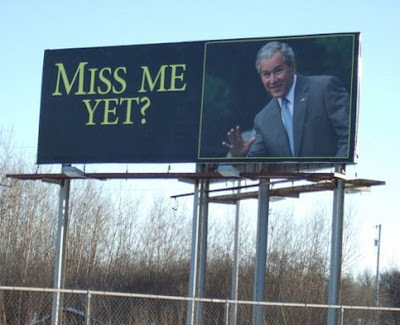 And, of course, George W. Bush was constantly presented as a buffoon. “Poor little stupid Sarah Palin,” they are all saying. She wrote “Energy” on her hand to remind herself to bring up the need for more drilling. She wrote “Cut taxes” because she believes that is how to get our economy moving. She wrote “Lift America’s spirit” because she knows America needs inspiration. Our president doesn’t write notes on his palm. He “knows” that limiting drilling is a great idea while we grow more dependent on people who hate us. He “knows” that raising taxes on families and small businesses is just the thing to do when the economy is on the ropes. And he is too busy apologizing for America’s sins and bashing businesses to think about lifting our spirits. So who is the stupid one? Tags: Gary Bauer, media bias, notes, Sarah Palin, teleprompter To share or post to your site, click on "Post Link". Please mention / link to the ARRA News Service. Thanks!